This simple, sweet design is based on the current Lawn Fawnatics inspiration board challenge. I drew from the heart images and the knit pattern on the socks and incorporated those elements into my design. 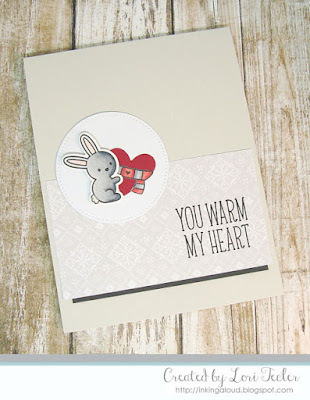 For the focal image, I used a bunny from Lawn Fawn's Snow Day stamp set. I colored the image with Copic markers and cut it out with the matching die, then paired it with a red heart "dressed" with the set's scarf image. The image panel was adhered to a pale gray card base over a pale gray patterned panel from the Knit Picky paper pad. 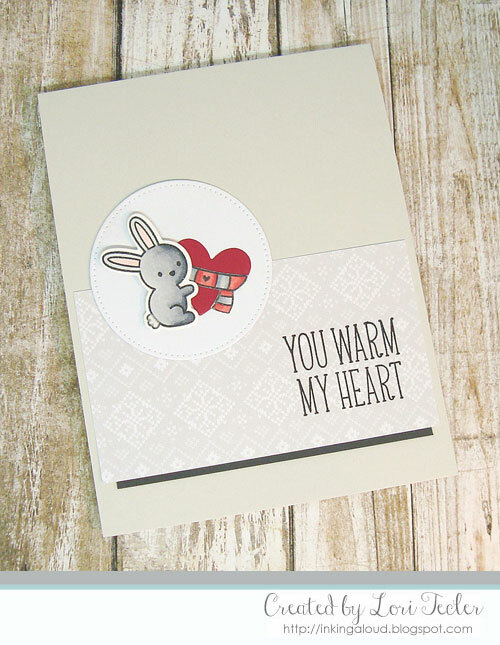 The "you warm my heart" sentiment from the Snow Day set was stamped directly on the panel in black ink. I tucked a narrow darker gray strip beneath the bottom edge of the patterned paper panel to set off the two shades of pale gray (pattern and solid) from each other just a bit and complete the design. Super sweet, what a cute card. Thanks for playing along with our Lawn Fawnatics challenge!! !